Stylish and compact, this Bluetooth Voice and Call Recorder easily fits in your pocket to offer one-touch recording when you want it. Record on the fly as a instant voice recorder, leave it in an empty room and set up voice activated recording, or even schedule recordings for a future date. Direct playback of the recordings is even made available through the built-in loudspeaker. 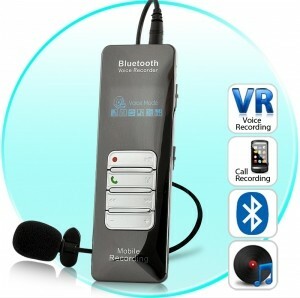 Stylish and compact, this Bluetooth Voice and Call Recorder easily fits in your pocket to offer one-touch recording when you want it. Record on the fly as a instant voice recorder, leave it in an empty room and set up voice activated recording, or even schedule recordings for a future date. Direct playback of the recordings is even made available through the built-in loudspeaker No batteries required since it has a built-in rechargeable lithium battery. Will charge up by plugging into any USB jack , Internal Microphone is placed on the top of the recorder making it easy to fit into a shirt pocket out of view. Has a large LCD screen backlight with A-B marker repeat function. You can even download and play MP3 music into the recorder. Three audio recording formats, (LP)ACT, (SP)WAV, (HP)MP3.